This title was first published in 2000. The law relating to directors’ duties has fundamental implications across the business environment and yet few areas of business law have received so little detailed examination. This text provides fresh and incisive insights to the rules applying in ten major economic jurisdictions within Europe, with respect to directors’ legal obligations and liabilities. 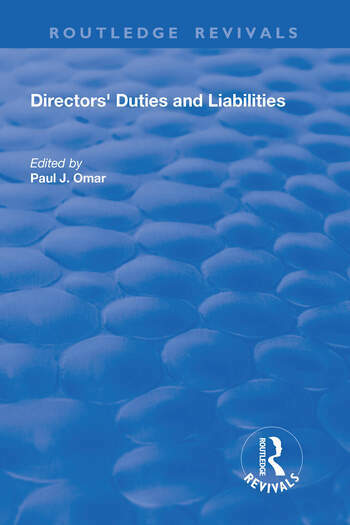 Written by the foremost figures in the field, each contribution outlines the statutory provisions that affect the work of company directors in each jurisdiction, including general legislation and specific laws covering the status of incorporated bodies. Fully illustrated with case-law examples the book provides a guide to the range of measures which national courts may provide for participants in corporate life seeking remedies for unsatisfactory governance of companies. It also features guidance on the specific bases for criminal and civil liabilities and examples of the range of penalties to which directors might be subject. The result is a work of unprecedented detail which will be welcomed by practitioners in the corporate sector, academics and researchers alike. Contents: Austria, Dr. Friedrich Schwank; Belgium, Nicole Van Crombruggghe; England and Wales, Laurence Pritchard; France, FranÃ§ios-Xavier Lucas and Andrew West; Germany, JÃ¼rgen BrÃ¶hmer; Italy, Tomaso Pignatti Morano; The Netherlands, Gérard Carriére; Portugal, Rui Peixoto Duarte; Spain, Rosana Hallett; Switzerland, Philipp KÃ¤nzig; Index. Barrister, Gray's Inn. Advocate and Solicitor, Malaya.